Scott Rupp and James Tarr take you to the range to talk about what to bring, how you can train and how you should behave. Some shooters say they 'practice,' others say they 'train.' Are they the same things? Jim and Rich tackle these often misunderstood concepts. Jim, Rich and Jessica show you what you need to know for more effective concealed carry. On 'Help Desk,' Rich and Jim go over different styles of triggers and what they're good for, and Jim and Scott debate the merits of two popular .22 semi-autos. There's a wide variety of ammo on the market for the AR1-15, and Jim and Rich explain how to select the right one for your needs. Jessica, Jim and Scott dive into the world of .22s -- both rifles and pistols -- and show why they're not only fun but great training tools. Scott, Rich and Jim go in-depth on carbines and demonstrate why these guns are great defensive arms. 'Help Desk' covers the critical decisions in choosing a holster, and on 'This or This?' Jim and Rich have a red dot versus iron sight showdown. Jessica, Jim and Rich tackle home defense with handguns and rifles, plus flashlight techniques that help defenders identify and hit their targets. On 'This Or This,' Scott and Jim try to settle their debate on which semi-auto rimfire platform rules. Rich, Scott and Jim explore the world of revolvers. Rich and Jim talk carry-gun ammo maintenance on 'Help Desk,' and on 'This Or This' they have a timely debate on which is better for defensive handgunning: red dots or iron sights. Jim and Scott tackle medium-distance targets to demonstrate techniques that will boost shooters' skills with both bolt-action and semiautomatic guns. 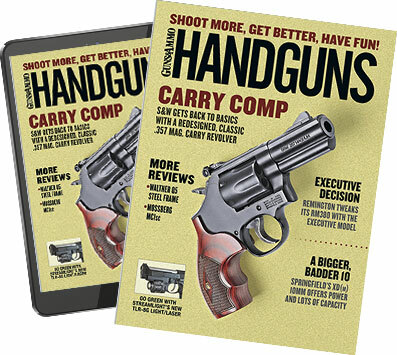 Scott, Jim and Rich shoot and discuss handguns suitable for home defense and daily carry. Rich and Jim argue the merits of striker-fired pistols vs. 1911s in a must-see throw-down on 'This Or This?' Rich demonstrates techniques for managing recoil. Jim, Rich and Jessica talk about their shooting problem areas and show practice techniques that have helped them improve. On 'Help Desk' Rich and Jim discuss options for concealed carry gun placement. Rich tackles close-quarter tactics for carbines.